This will a big shock for the West Bengal Chief Minister Mamata Banerjee as this year she will fail to give Rs 28 crore for Durga Puja. 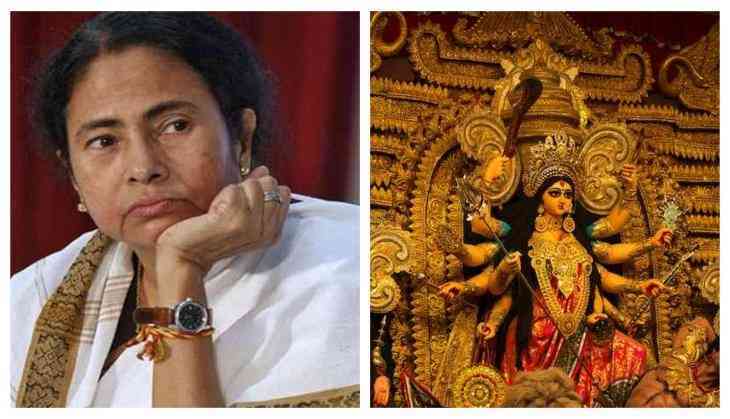 Yes, this decision was announced by the Calcutta High Court, which has put a stay on the distribution of the amount on Friday to the Durga Puja committees across the state till Tuesday. Last month, Mamata had announced to give Rs 10,000 to 3,000 puja committees in Kolkata and 25,000 committees in the rest of the state. The decision was challenged by advocate Sourabh Dutta in a PIL. A division bench of acting Chief Justice Debasish Kar Gupta and Justice Shampa Sarkar have questioned the government that on what basis they are distributing the amount for Durga Puja celebration and also asked that if there were any guidelines to release the amount. The bench further asked that if the exchequer money is only distributed for Durga Puja or other festivals also. The division bench also questioned to the government that on the one side the state government has claimed that they are debt-ridden but on the other hand they are giving this huge amount. Asked them to justify it. ‘What actions will be taken if the committee misused the money? the bench asked. Calcutta HC has asked the Mamata government to file an affidavit clarifying all the questions raised by the court in the next hearing. However, no one was there to answer the questions, said News18 reports. On the other side, state BJP President Dilip Ghosh has welcomed the decision of the court and said that Mamata is doing the politics by doing such kind of things on the basis of religious grounds. He said that Mamata always concerned about the debt but on another side, she announced to give Rs 28 crore to puja committees. Ghosh questioned that from where is she getting the money?